This weekend I am doing the Handmade Arcade again. This will be my 4th time doing the show! Before you think I am total nut doing a craft show only a few weeks after having a baby, I made all my stuff back in Septmeber and I am happily resisting the urge to sew a single other item before the show. It feels so wierd to have a show in only 2 days and not doing any last minute stressy sewing. When I say wierd, I mean it feels really great! 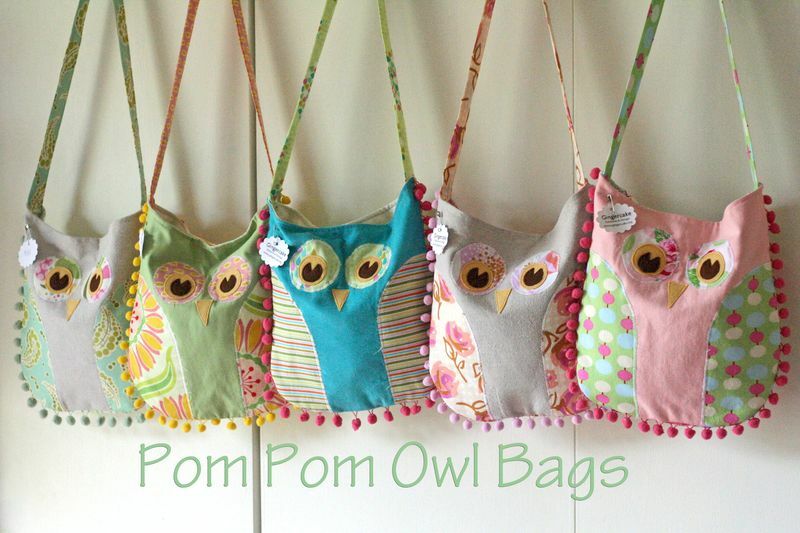 This time I made all my owl bags with pom poms for the show. Remember this cute bag? I worked out how to make it easier by tacking the pom poms on with steam a seam light. This was great and made the process much faster. You have to cut the steam a seam into sections to get around the curve. Once the poms poms are attached, then you sew the 2 sides together and DO NOT trim your seams down. The last time I trimmed my seams and ended up with several poms poms falling off and it's pretty tedious sewing those little suckers back on by hand. I use the hooks for the towels in the bathroom. The backdrop is the coat closet by my front door. I open my front door to get better light (even though it was 27 degrees outside!). This is my best location to get a wider shot of my creations even though the natural light is only mediocre. The first photo I lightened up in PSE and second I just did in my iphoto. I had to really work on all those shadows! Vanessa is giving away a copy of her ebook for sew mama sew giveaway day so head over to her blog and leave a comment for a chance to win! 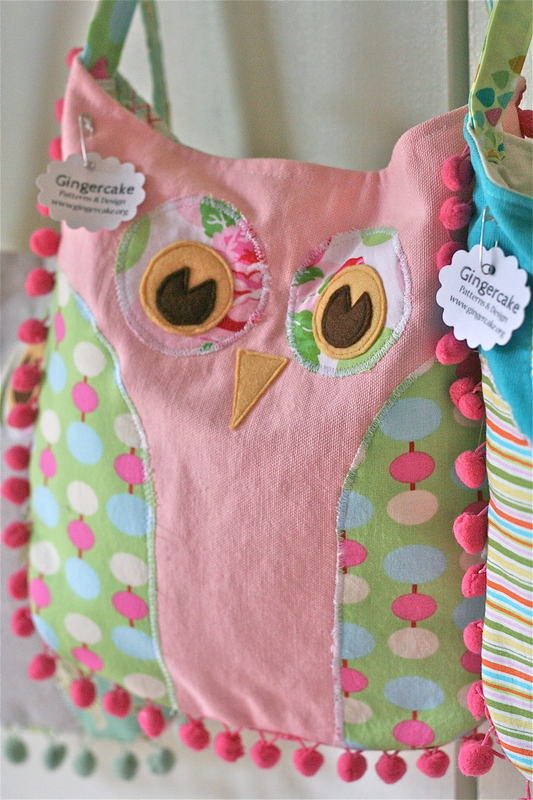 I still think you’re a total nut, but its worth it to find good homes for those adorable bags. I am such a sucker for pom pom fringe. Good Luck. You always pick the cutest fabrics. I love those bags. 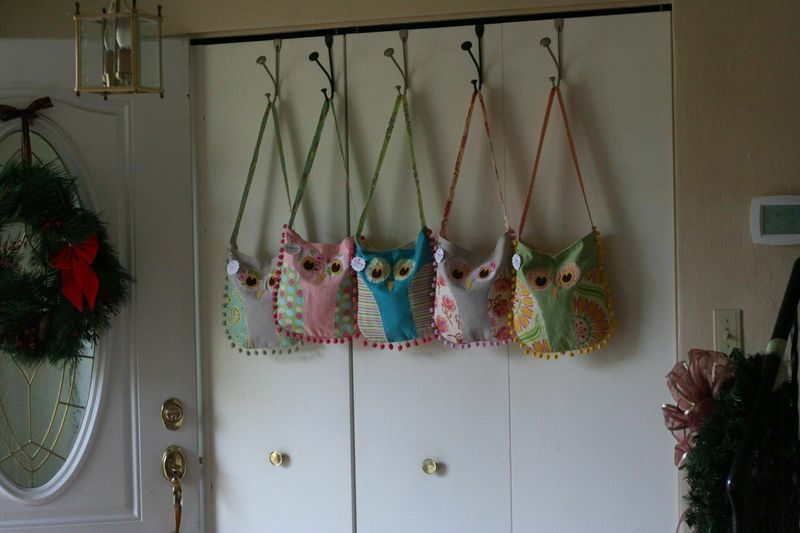 I have high hopes that my Lola owl pillows will be done by Christmas. Those owl bags are just the CUTEST things I’ve ever seen!! Of course, all your stuff is. Love it, love it!! Wow. These are really cute. You are so kind to share your designs with everyone. Very neat work. Thanks for sharing.